+/- 650kms ❖ +/- 17,000m ❖ 6 nights/7 Days ❖ 2200€ pp. Never heard of the Cottian Alps? Neither had we until a client wanted us to create a route that would rival our Epic Alps trip, et voila! The Cols are right out of the Tour de France: Colle di Finestre, Agnello, Vars, Cayolle, Champs, Allos, Bonnette, St. Martin, Turini and Lance’s favourite training loop, the Madone! The scenery is a 10/10 this week as are the climbs. The trip ends in the soft Mediterranean hills just above the bustle of Monaco. Click here to read one of our rider’s thoughts regarding this exceptional trip. We can, if you wish, adjust the week and make it a tad friendlier for your group. Ride difficulty 11/10: This trip is for experienced riders only. There is plenty of climbing with the ensuing fast and sweeping downhills. This trip can be shortened and it can also be lengthened for those that want even more. Most days have extensions to the base rides. We can turn this stunning week into a 9/10. Day 1: Arrival at Torino-Caselle Airport (TRN) and then the 45 minute transfer to Susa, Italy. Time permitting there is a loop ride from Susa. Day 2: This morning your warm up ride is the Colle di Finestre. Appearing only four times in the Giro, this single-lane beast is unpaved for the final 8 k to the summit. From there you have smooth asphalt all the way down to the valley floor. Multiple options for the rest of the day, but our favourite is to finish in Costigliole Saluzzo where we stay in a 400 year old Castello. Day 3: First up, the highest international Col in the Alps; Colle di Agnello at 2744m. This comes after a lovely gentle warm up to Casteldelfino at the base of the Agnello, and is probably the toughest climb of the week with some sections at 14%. 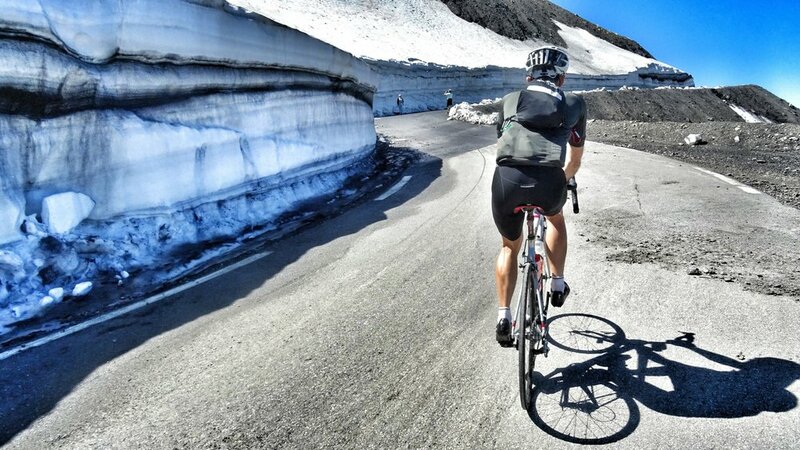 The 2016 Giro was lost in a snowbank just after the summit so expect to see snow even in early July. 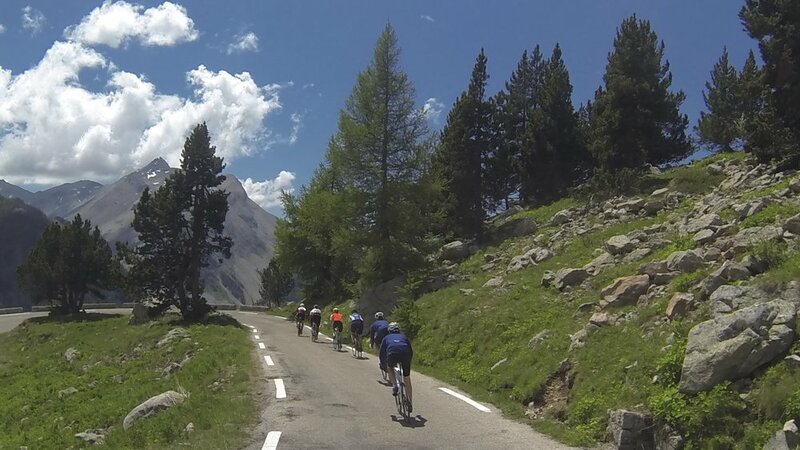 The rest of the day takes you down to Guillestre and then up to the Col de Vars and finishing with the long descent to Barcelonnette, your home for two nights. Day 4: Some would say that today is THE ride of the week (but then you have yet to see what’s coming afterwards). Col de la Cayolle, Col des Champs and finishing with the beautiful Col d’Allos, today is extraordinary! No words. One of the BEST loops ... ever! Day 5: Col de la Bonette is your first climb and what a beauty. Labelled as the "Highest Col in the Alps" it is a cyclist’s dream. In order to ride the “highest” part of the Col, you have to do the little loop at the top of the Bonette to actually tick that box. After the 60k! of downhill your next Col is the quiet St. Martin and then on to your next hotel in St. Martin-Vésubie. Day 6: Easiest day of the week with two amazing climbs on tap. The turny-twisty Turini and the Madone, but we throw in the Castillon as an extra little bump. Tonight there is a celebratory dinner waiting for us in our final stop in La Turbie, France which overlooks the blue waters of the Med. Life could be worse. Day 7: Transfer day to Nice airport (NCE) for your flight home. Nice airport is a short 30 minute drive from La Turbie. A big thanks to Kev M. for his superb photos. Keep 'em coming.